Pure Cleaning Services is a family run business based in Barnsley, South Yorkshire. All cleaners are full trained, uniformed and fully insured. The company provides a professional window cleaning service to both residential and commercial customers. As well as window cleaning they also clean fascias and soffits, solar panels, conservatory roofs and gutters. They also provide an oven cleaning and carpet cleaning service as well if required. With a 100% satisfaction guarantee offered you can be sure of a quality service. North East Cleaning Solutions are a leading exterior cleaning company based in the Tyne and Wear area. 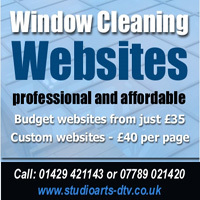 Their commercial and domestic services include window cleaning, patio and driveway cleaning, pressure washing, conservatory cleaning, Upvc fascia & soffit cleaning and gutter cleaning. For a FREE no obligation quote you can contact them using the numbers below. Everclean Limited provide commercial and residential window cleaning services throughout Teesside and the North-East including Middlesbrough, Stockton-on-Tees, Ingleby Barwick They provide a regular service to domestic customers and commercial customers using the latest water fed pole techniques which uses pure water for cleaning windows at height. This type of cleaning is much safer and also has many benefits to the customer. If you would like further information or would like to contact Everclean Limited for a free quotation please contact them on thenumbers below or via their website. As one of the leading window cleaning companies in Harrogate, Rafa Window Cleaning provides a professional, high quality service that ensures a competitive price and a regular, reliable service. Their staff are always friendly and courteous, as well as smartly dressed. The company is fully insured and provide easy payment methods including online payments for those who want to pay online. As well as cleaning the glass, the cleaning of UPVC frames and sills are included. They also clean fascias soffits and cladding. If you require your conservatoy roof cleaning they do that too. using a water fed pole they can also clean those difficult to reach windows above conservatories and high windows on 3 storey houses. Their WFP system is also ideal for many commercial properties that require a higher reach, where the use of ladders would be unsafe, and hiring expensive equipment can be avoided. For more information about all the services they provide please call on the numbers below. Founded by the owner Kevin Bilclough, Water Force Window Cleaning Services based in Bramley, Leeds has gained a solid reputation for being a company that you can rely upon. The company and their highly trained staff can provide a comprehensive cleaning service for anyone requiring a window cleaner service in the Leeds area. Their services include commercial and residential window cleaning, conservatory cleaning, fascia and soffit cleaning, gutter cleaning and patio, driveway and decking cleaning.